So, you’ve thought about creating a really nice library for your classroom, but you’re short on cash? Here are five places you can get books on the cheap! Craigslist is a great place to get good deals. I’ve bought lots of books on Craigslist – one time was from a retired teacher who was selling all of her books in great condition for 10 cents each! Of course, in most cases this entails you driving to the seller’s house, so make sure you are careful, take a friend along with you and if the place you are going looks seedy, just turn around and go home. I cannot tell you how many times my sister (who is a school librarian) and I have been to garage or yard sales where we have found incredible deals on nearly-new books. Some of the books didn’t even look like they had ever been opened, and they were all going for 50 cents a book. 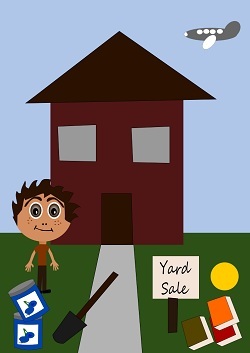 Check your newspaper, neighborhood flyer, or Craigslist to locate upcoming garage sales near you. The best garage sales are the neighborhood-wide garage sales because you can hit several houses at one time. Also remember that a lot of sellers are cool with haggling over prices – if you see a book and want to offer a lower price to buy it, or want to buy a group of books together for a discounted price, it couldn’t hurt to ask. Sometimes you can find great deals at used book stores… but sometimes not. It’s definitely worth a shot. Also, sometimes used book stores have sales of up to 50% off their entire stock… those times especially are when I’ve found some amazing deals. eBay doesn’t seem to seem to have as good prices as it once did, but if you look hard you can still find the occasional bargain. Be on the lookout for books sold in ‘lots’. Those have the best deals overall. You might be surprised at how many books I’ve received free simply because I let my friends know that I was in the market for hand-me-down books. When they gave me the books I even informed them that they could take them to the half-off bookstore to sell them or sell them at the neighborhood garage sale, but for them, it was far kinder and less stressful to simply give them to me for my students. Giving away books gives people the chance to clean out their house a bit – books can be bulky! – and I got free books out of the deal, so it’s a win-win situation. Also along these lines, you can have a book swap with some friends or other teachers with children or students of their own. Give them books you no longer need in your school library and get books that would fit in perfectly with your grade level. Again a win-win situation! Plus, refreshing your library gives your students a chance to read some new – to them – literature. Do you have any other creative ideas about how to get cheap books for your class library? Leave a comment and tell us all about them! Thanks for sharing Tammy – that is a great tip. And it sounds like your local library found a great way to freshen up its collection while also finding a home for the books it didn’t need anymore. Very glad to hear about it! I use half.com (part of e-bay) for books. Most of the time I find great deals. I also use the school’s book fairs. Sometime I find hardback books for $5 and paperback for less. I recently found hardback Eric Carle books at Kohl’s for $5. All proceeds went to The Children’s Hospital. In addition to the books are stuffed characters from the books. The books change so you have to check back. Thanks for the ideas! Children’s books are my vice – love them. I will graduate soon and have been building my library through book fairs, thrift stores, used book stores, and online stores. I didn’t think to check Craig’s List. Thanks very much for your insight Ranae… I really appreciate it! I haven’t checked out half.com yet… I will have to do so. And I agree that sometimes you can find some good books at discount stores in the racks near the front of the store, for a good price… it’s always worth checking out. And definitely if the proceeds from book purchases go to benefit a charity or an organization you appreciate, that makes buying well-priced books all that much more fun to do! Thanks again for your recommendations! And all the best with your future book-buying. I have had great success with http://www.bookcloseouts.com. It is easy to find paperbacks under $3 and their service is great. I use it to round out our library after collecting books from friends/family and hunting at garage sales. Thanks for the suggestion Dana, I appreciate it! I will check out the site. Paperback Swap.com is a site where you can post books (for adults or kids) and others can browse and “order”. If a book is ordered, you mail it to the requester for free. On the flip side, you can order from someone else and the book will be sent to you – no charge. Hi Diane – thanks for the recommendation! I will check out the site.